My cousin, (and pseudo sister) Jenna, is pregnant with her first baby and is due November 5. (My sisters and I threw her a baby shower a few months ago). She knows she’s having a boy, but she wants gender neutral decorations. We gave her a hand-me-down crib bedding set that has jungle animals, similar to the Tiddliwinks Safari bedding at Target. 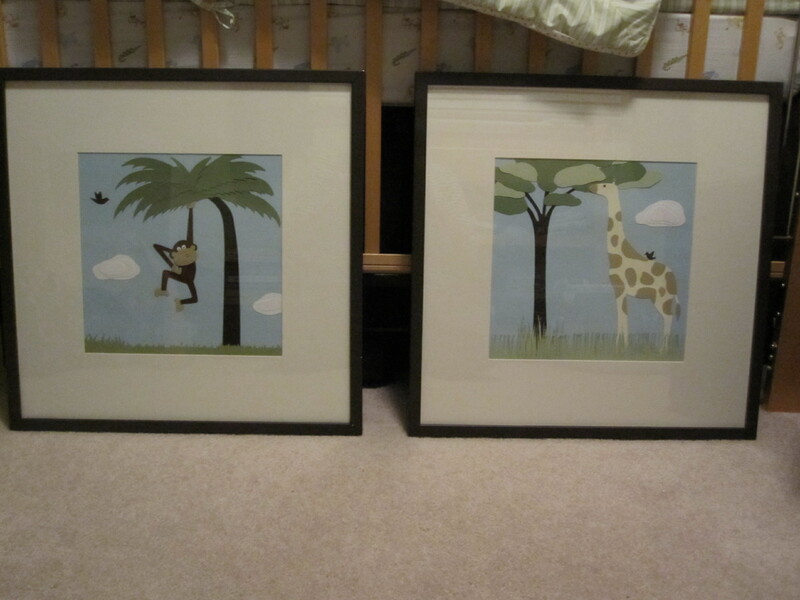 Jenna asked me to create two custom art pieces for the nursery. 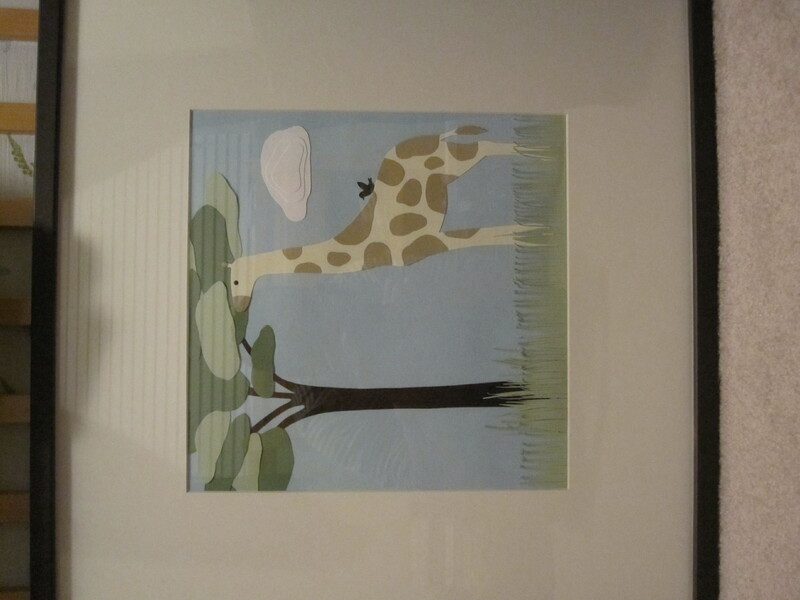 Her only requests were to include the nursery colors (chocolate-brown, sage green and cream), monkeys, giraffes, and birds (to coördinate with the bird mobile I made as a shower decoration/gift). That’s it. The rest was up to me. I love free rein designs. Jenna had already purchased two IKEA Ribba frames with mats. I considered designing two custom 12 inch square prints to fit the frames, but decided to create custom cut paper scenes. A year or so ago, I created a cut paper scene of Ben and I in our wedding attire as a custom art piece for our home. 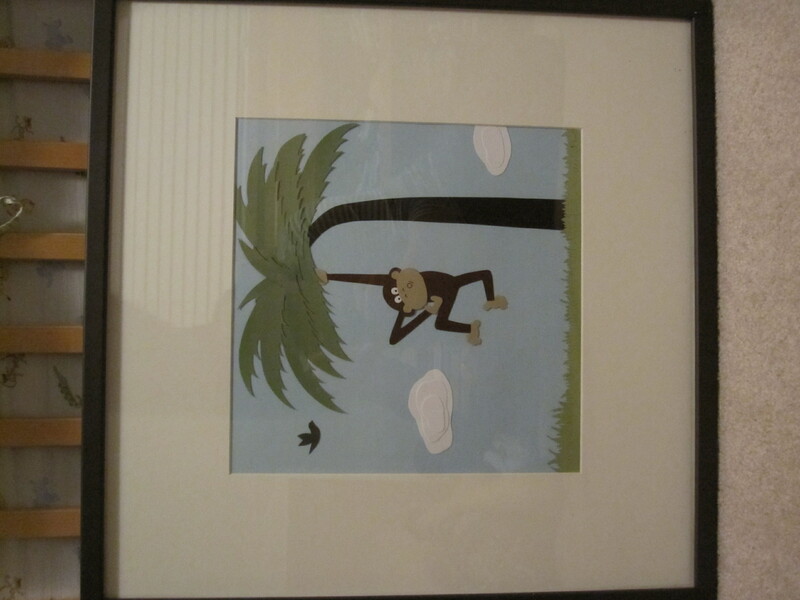 The first piece features a cartoonish monkey hanging from a palm tree with a bird flying by. The second piece has a giraffe standing in tall grass, a little bird perched in the giraffe’s back, and an Umbrella Thorn Acacia type tree. Both pieces are entirely hand-made with pieces cut from cardstock. While in Minnesota recently, I visited her house to help with some final nursery touches, including matting and framing her new artwork. We didn’t get around to hanging the pieces, but we’re both very pleased with the result. I am taking orders for custom art pieces, including cut paper scenes, silhouettes, prints and modern paintings. To see samples, ask questions or place an order, please visit our Etsy shop. You have such an incredible talent! These are just incredible, I can’t stop drooling! Thanks, Jen! I really love the finished look, but I’m biased. I hope you’re enjoying your art, too! 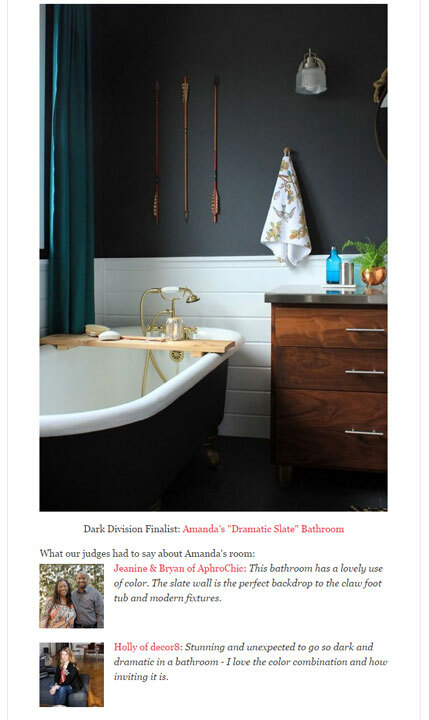 Hi I am looking specifically for something in a cute cartoonish monkey picture….I am doing my sons room in monkey design…..if you would like to see the design for colors, please look up jojo designs monkey bedding…it will show you. I would like some type of picture to hang in his room, can you make something maybe size of 11×14? If you can please le tme know and the cost. Also love the No more monkeys jumping on the bed in words idea as well and went I went to go order it it said already sold?? ?